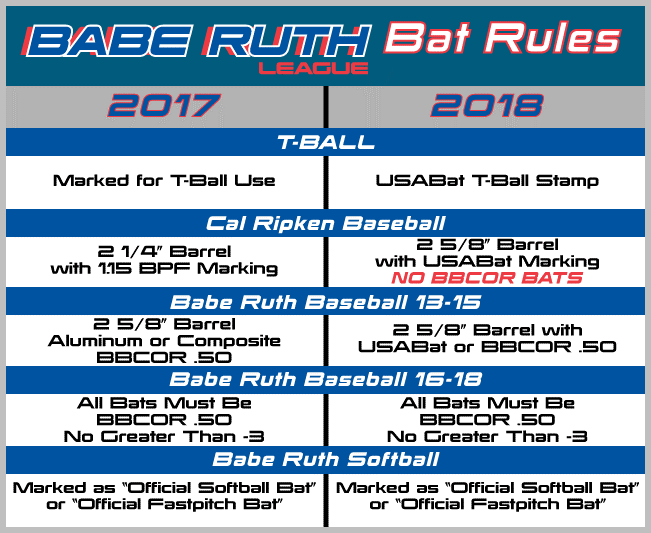 Effective January 1, 2018 the Babe Ruth League rules governing legal bats for T-Ball, Cal Ripken and 13-15 Baseball have changed. Cal Ripken Division – All non-wood bats must have the USABat Marking. The Barrel Maximum is 2 5/8″. No BBCOR Bats are permitted in the Cal Ripken Division. For the T-Ball Division, bats must be marked with the USABat T-Ball Stamp. Read more about the USABat T-Ball sticker program. Babe Ruth Baseball 13-15 Division – All non-wood bats must have the USABat Marking or marked BBCOR .50. Bat Barrel – 2 5/8″. Babe Ruth Baseball 16-18 Division – All non-wood bats MUST be a BBCOR .50 and no greater than a -3. Barrel – 2 5/8″.